My spousal unit, who actually writes this blog, is an author and illustrator of books for kids. She ran across this website for aspiring engineers, and thought it would be interesting to some of my readers. DiscoverE (formerly the National Engineers Week Foundation) helps to unite, mobilize, and support engineering and technology volunteer communities. They hope to increase the collaborative footprint in K-12 education and celebrate with the public as it discovers the value of engineering education and careers. I was especially intrigued by their Zip Line Challenge for kids. It’s actually a model that challenges kids to transport a ping-pong ball down a zip line from start to finish in 4 seconds or less. The activity discusses many of the considerations when designing and building a zip line. I’ve uploaded the PDF so you can download it from here, or you can get it from the website listed above. There are a lot of other creative engineering related activities there, all free to download and use in your classroom, home, summer camp, whatever. One of these years I hope to finish my zip line. All is ready, but now the brush has grown up so much I have to hire a tree climber to clear the 420 foot long pathway. View from the zip line tower to the landing 420 feet down the hill. Thanks for stopping by! 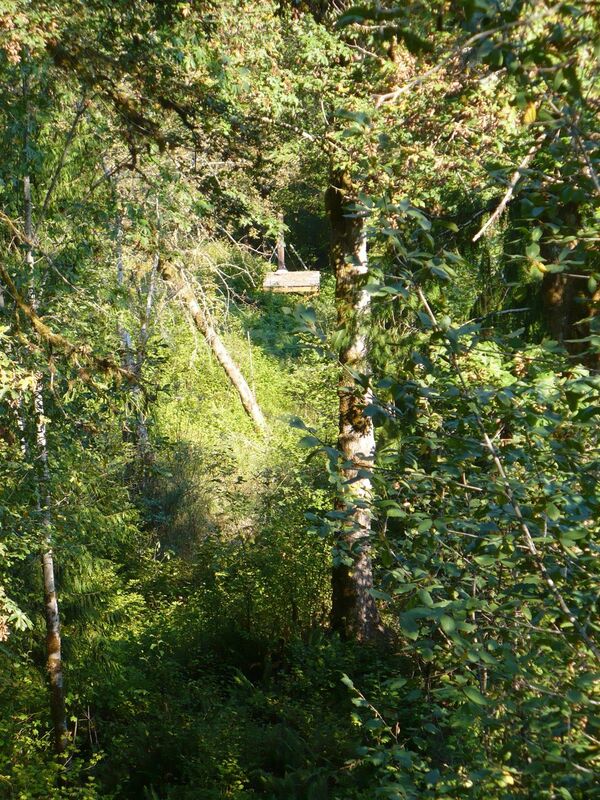 Be sure to check out our bridge book if you’re thinking about a DIY suspension bridge. Here is the link: Building a Small Cable Suspension Bridge with the Cable Locking System. When I created this blog I promised something would be posted about zip lines aka ziplines. So, here is the first post about all that. Zip Line Test with Fake Spousal Unit Getting Seriously Hurt. While I was pleased at the 32 MPH speed, this test proved that I need to raise the final cable a bit on the tower tree and on the base post as well when I finalize everything. There are more photos of the building process on my website: Zipline Photos. The full size cable is up on the hill ready to install but at this point the path down the mountain needs to be cleared (again) before we continue with the construction. For now, I’m working to finish building our house, so this project is on hold for the moment, but will be completed at some point. 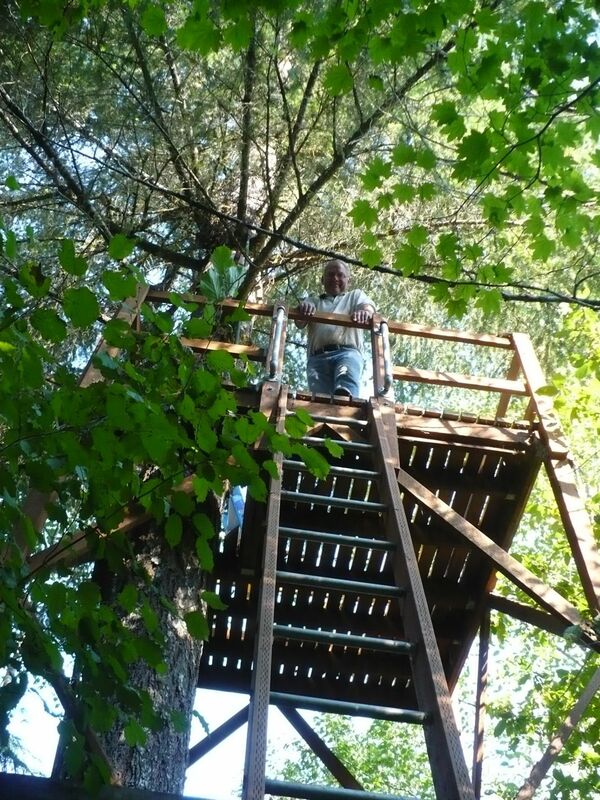 What’s funny about this particular project is that when my spousal unit’s elderly relative heard about it, she wrote us out of her will, telling another relative in private (which of course didn’t remain private) that “Building a zip line is pure Tom Foolery! These people have time to burn!” Well, building a zip line is what I do on the weekends rather than watch football. Just don’t call me Tom. Images, diagrams, and text copyright 2013 by Marvin Denmark unless otherwise noted. Please do not copy and post my content anywhere without my permission. Thank you.